At the end of November 2015, we were exchanging experiences and made plans for further cooperation on the field of Roma inclusion. Despite the reluctance of the Mayor of the suburban area of Saint-Genis-les-Ollières and his going to court in order to terminate the building project of a Roma village, the court declared that the construction activities should not be suspended since the validity of the building permit could not be questioned. The 10 hectare site of the Roma village is expected to welcome 20 Roma families, that is to say nearly 80 people, in the framework of a vocational integration program entitled IEE ‘Integration through Employment and Education’. 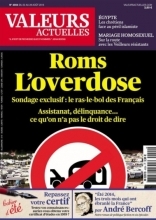 Released in 2013, the related issue was entitled ‘Overdose of Roma people-A survey reveals that French people are fed up with Roma people-Financially supported, offenders…what we are not allowed to say on Roma people’. The heading of the main article in the issue was ‘France is being invaded by gypsies mainly coming from Romania and Bulgaria’. A member of the City Council of Greater Bordeaux submitted an oral question during the last official meeting on the fact that the presence of Roma gypsy communities on a specific site they were said to have ‘invaded’ was raising health and safety issues. The Mayor of the local town of Haillan-Andréa Kiss- replied that those communities were not gypsies but Bulgarians and as such full European citizens who had the misfortune to be expelled from Mérignac-another town which is part of the Greater Bordeaux territory. The ‘Aréas Gypsies and Travellers’ Unit of the French organization La Sauvegarde du Nord has been implementing for over one year and a half now a vocational integration project which successfully works towards the integration of Roma communities living in the city of Lille and its surroundings. We have been developing new tools and methods in order to facilitate the insertion of marginalized communities such as Roma people thanks to our collaboration in the eRoma Resource Project or our involvement in a European project working towards the establishment of a pilot program for the economic and social integration of women from migrant origins called `I AM AN ACTIVE MEMBER OF MULTINATIONAL SOCIETY` (IamMS). Since a couple of years, several arrivals of Roma families from Romania and Bulgaria have been reported in the city of Toulouse-located in the south-west of France. Many of them arrive in France after a working period in Spain or in Greece. When they arrive, they are settled in slums in which they are living in deprived environments with no fair access to public health systems or a decent housing. They are actually marginalized and discriminated against. Last week we were invited to present a platform on the seminar about positive experiences of teaching staff working with children and pupils from marginalized Roma communities. In November we introduced a platform on two conferences. The first was held at the Catholic University in Ružomberok and the second one in the Czech Republic. During the conferences we met with positive reactions to the development of the platform with the promise to potential cooperation to the next period. At the Ministry of Health, we met with the Director of the Department of Public Health Dr. Vadovičová, Ing. Ferjančík from department for national projects and Mgr. Zaujecová from NGO Healthy Communities. On 7 October we organized a workshop for experts from the Implementation Agency Of Slovak Ministry of Employment, Social Affairs and Family and the Municipality of Trnava, Palárikovo, the municipality Mojmírovce, particularly field social workers and staff from the Department of social protection of children, and not least for professionals working on Roma projects focusing on education and social work at Trnava university. On last December 4, the ‘Chakaraka’ movie was aired on the screens of the Jean Eustache arthouse cinema-a cinema located in Pessac, an area within the urban city of Bordeaux. Following their participation to the international conference ‘Broaden Horizons-Networks and Experiences for successful Roma inclusion’ of November, the French organization from Toulouse in the south-west of France-Rencont’roms nous-is carrying on its activities towards the integration of Roma communities through a cultural approach with the implementation of art and cultural workshops in December. On December 16, ADICE will present the e-RR project to future professionals who will most likely be working from time to time with Roma people in their daily activities. On 5 October we visited future professionals - students of ending years studying at the Institute of Roma Studies Constantine the Philosopher University in Nitra, under the auspices of the director doc. Kozubík and colleagues. 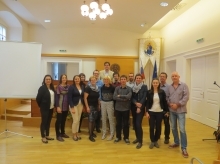 Yesterday People's University of Kočevje presented the project e-RR in Murska Sobota (South-East region of Slovenia) to representatives of Primary School Puconci, Primary School France Prešeren Črenšovci, directors of People's University of Lendava, People's University of Murska Sobota, where we hosted and Roma activist and journalist. In October 2015 we presented educational opportunities for the Roma, offered by RIC Novo mesto, which have been carried out since 1994, including projects e-RR and Finally. On the 21st October another dissemination exploitation workshop was carried out at RIC Novo mesto. As part of the international e-Roma Resource project the third workshop was held on 19th October 2015. The workshop was held in Zagreb, at the premises of Croatian Employment Service, Regional Office Zagreb. 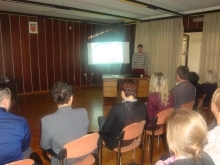 This week People's University of Kočevje implemented a fifth dissemination-exploitational workshop for employees of the Social Work Centres Kočevje and Ribnica, both municipalities, the Kočevje police station and for employees of the Health Centre in Kočevje. Croatian Employment Service, Regional Office Karlovac organized 8th Job Fair in the Karlovac County. Within the Job Fair, a round table ‘’Compass to exit the long-term unemployment - portal e-Guidance’’ was held. In the framework of this roundtable, e-Roma Resource project and platform were presented. The first workshop in the style of the World Café was realized 09/10/2015 at the Faculty of Health and Social Work, Trnava University. Invitation to the workshop have adopted different professionals working with Roma, for example field workers, family assistants, staff from the Department of Social legal protection of children from the Office of Labour, Social Affairs and Family in Trnava, a specialist in infectology, program coordinator of the Roma Institute, teachers and others. Ljudska univerza Kočevje (People's University of Kočevje) implemented two dissemination-exploitational workshops of the project e-RR in September 2015, for representatives of employment offices from Grosuplje, Kočevje and Ribnica and for Roma assistants and their mentors from primary schools in Maribor and Murska Sobota. On 24th and 25th September, the e-RR partnership carried out the 5th and last project meeting in Karlovac, Croatia. Our host organization was HZZ RO Karlovac. On 18th September 2015, RIC Novo mesto conducted a 4-hour workshop for a group of Roma assistants employed in various primary schools in the region, their mentors and employers, as well as the representatives of the Roma Incubator Škocjan. On 16.09.2015, a workshop was held for the Roma population at the premises of the Croatian Employment Service, Regional Office Karlovac. The workshop was titled ''How to look for a job?'' and its main goal was to help the Roma population members to find a job. The Ministry of the Interior plans to help the communities that are trying to integrate the Roma living on the margins of the society. The first funding of 64 million euros was offered to solve problems related to their low standard of living. Later, they are expected to create even more funding. "The money will also serve for the desegregation of the Roma in education. This will strengthen the pre-school education of Roma children. The assistance for municipalities will also focus on improving the co-existence with the majority population through the social work field and on improving the quality of healthcare, housing and access to employment opportunities," said the Minister of the Interior Robert Kaliňák (Smer-SD). Based on the decision of the European Commission, the operational programme Human Resources for the programming period 2014-2020 was approved on 9 December 2014. This operational programme will be financed from two priority project axes and it aims at integrating the inhabitants of the marginalized Roma communities. The Atlas of Roma Communities was based on "Simplifying the index of development" which defined a list of 150 municipalities that are the eligible beneficiaries of a prepared set of programmes, consisting of a basic package of Take away. Participation at the "ZORALIPE ROMANE ŽUVJENGRU - Empowerment of Roma Women"
The project team members of the international project e-RR exploit a wide variety of opportunities to showcase the possibilities for applying the project results of the e-platform in a local and broader national environment. 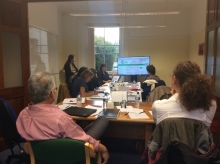 e-RR project and platform were presented to European partners during a workshop realized in Cardiff on the 11th of September. 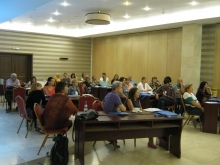 Between 3rd and 5th September 2015, the Consortium International Lectura si Scrierea pentru Dezvoltarea Gandirii Critice and its partners within the Literacy Cubed – Focus on Roma Families (LIT3) organized the final conference of the project. ADICE presented the project e-Roma Resource and the on-line platform to several European organizations during a seminar in Palermo. 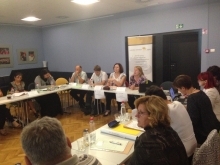 On 10th July 2015, RIC Novo mesto organized the first dissemination and exploitation workshop for the professionals of adult education field who work with the Roma. The workshop was composed of three parts. In the first part the e-RR team presented the project and its main outcome - the project platform, lead participants through platform and highlighted the most important parts of the platform (e-RR main menu, countries' pages, Library and Projects with possibilities for searching and downloading materials). Within the international project Grundtvig Multilateral – Financial literacy for Roma, which aims to improve financial literacy among the Roma and their knowledge concerning various consumer services, RIC Novo mesto, together with the partners from other 5 countries, has developed an educational programme and special tools adapted to the specific needs of the Roma minority and focused on gaining new practical skills. 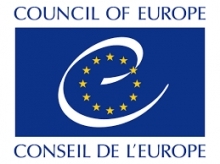 The project “Early Marriage – Culture or Abuse?” was awarded an action grant under the call for proposal in the framework of the Specific Programme "Daphne III" of the European Commission (DG Justice). In 2011,the Council of Europe launched 2 videos explaining the situation of Roma people and presenting some success stories of the integration of Roma people in Europe, which can be useful for raising-awareness campaigns. In Slovenia, we have achieved the first great success of the project SORO - Cooperation for the health of Roma people, which is co-financed by the Norwegian Financial Mechanism Programme 2009-2014. We have successfully completed the training for the profession of a Roma coordinator, with all the participants obtaining the certificate of national vocational qualification. 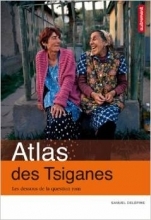 A book explaining the gypsy situation in France and Europe and a video about the intervention of a sociologist about the Roma, have been uploaded on e-RR platform. The integration of the Roma into the mainstream society is not a new challenge for Slovakia. We share it not only with our neighboring countries, but also with the rest of Europe, and the common solution is to be responsibly involved in solving the issue at the level of the European Union. Thanks to the financial help of Brussels, the Ministry of the Interior provides a comprehensive package of measures to integrate the Roma communities on the margins of the society, socially as well as economically. On 06.11.2015, Pecovska Nova Ves (District Sabinov), hosted the conference " Rómska osada a samospráva: dobrá prax, sen či realita?“ (Roma settlement and government: good practice, dream or reality? ), under the auspices of the President SR Andrej Kiska, where the positive examples of work with the Roma, the adapting ways, and the first results of pending activities were presented. 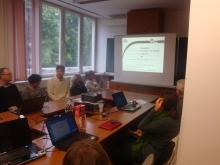 On 27th and 28th May, the e-RR partnership carried out the 4th project meeting in Roubaix in France. The partners devoted most of their time to the review of the platform, which is just about to be publicly launched. Other meeting topics were oriented in planning the project activities by the end of the project. RIC Novo mesto has been engaged in the activities for better Roma inclusion for many years. We are working closely with a variety of experts, organizations and municipalities in the region. On 19th-22nd January 2015, a group of directors and primary teachers from eastern Slovakia participated in the exchange visit in the Czech Republic, which focused on exploring Fair schools programme and its implementation in practice in Ostrava, Moravian Beroun and Brno. Education contributes to the critical state of perception and identification of options for change. We consider a public debate on the quality and accessibility of education as one of our priorities. We work with teachers and parents, whose participation in promoting changes in the education system we consider important. Fostering the public and non-profit sector in shaping educational policies, in order to realize the dissemination of critical thinking discussions, workshops, and expert discussions, which represent the current European trends in education. 9 Governments of the countries of Central and Eastern Europe, including the Slovak Republic, proclaimed the period 2005-2015 as the Decade of Roma Inclusion and they have undertaken the actions that will eliminate discrimination and close the unacceptable gaps between the Roma and the rest of the society. The Government has adopted a strategy through the Resolution no. 1/2012 of 11th January 2012. The strategy was developed by the Office of the Plenipotentiary for Roma Communities with the help of the World Bank, UNDP, NOS, ZMOS and NGOs. So far, a similar research in Slovakia has not been undertaken yet. Based on the current incremental research, in which the promoter participated, it is obvious that in those areas takes place between Roma active missionary activity of various traditional and non-traditional (new) religious movements. As previously shown, the direct and indirect impacts of their activities, the social inclusion of Roma exclusion. This tool is currently only seems to be particularly effective in removing various "social pathologies" among marginalized Roma, but also as an instrument working already in the short term. Through its special programme, the Ministry of Culture supports cultural activities of the Roma community in Slovenia. The Roma projects have been a part of the special programme of the Ministry of Culture since 1993. 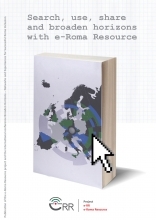 The 3rd e-Newsletter of the e-Roma Resource has been finalized and disseminated. Several videos have been made and published on French television. These videos are presenting the life conditions of a Roma family who lived in the North of France and who had to go back to Romania. The first project, entitled "Words of Roma", has been created by Roma Solidarity group from Lille Métropole and the Vidélio Production Association. At the premises of the Croatian Employment Service, Regional Office Karlovac, a workshop was held for the Roma population. The workshop was titled ''How to look for a job?'' and its main goal was to help the Roma population members to find a job. On behalf of the Montenegrin Government, a conference entitled Economic Empowerment of Roma was held in Podgorica, Montenegro by he current Presidency country of the Decade of Roma Inclusion 2005-2015 Initiative from June 17 to 18, 2014. 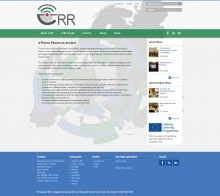 As we have already written in our second newsletter, the e-RR partnership prepared and also carried out the first presentations of the structure and contents of the e-RR platform. On 2nd and 3rd October, the e-RR project team of RIC Novo mesto participated at the conference Empowering marginalized groups through education and training in the Danube region in Wiena. 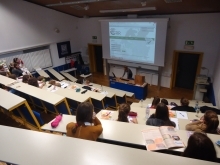 The conference was organized by the Austrian agency for international mobility and cooperation in education science and research – Department National Agency of Lifelong Learning and the Austrian Ministry of Education and Women’s Affairs. 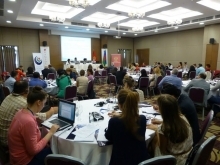 The emphasis of the conference was on the integration of socially disadvantaged pupils – particularly Roma Children’s access to education in the Danube Region Countries. The main aims of the conference were discussion, awareness raising and network formation. From 25th to 30th May 2014, the lead partner (RIC Novo mesto) members of the e-RR project team participated in the study visit in Krakow (as part of the LDV – VETPRO, Sharing and Learning project). The host organization was The Union of Associations Multicultura, which is also a partner in the e-RR project. At the end of March, the e-RR project partners attended the e-RR project's kick-off meeting. In September our project team was working on preparing the proposal for the structure and contents of the international platform. Prior to the preparation, we analysed the current situation on different Roma issues in our partner countries and throughout Europe.